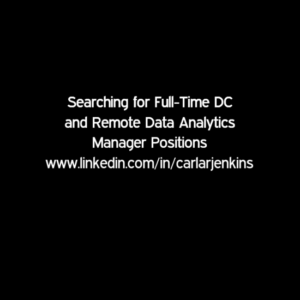 I am actively searching for remote and DC metro are Data Analytics Manager positions. I have over 10 years’ data analytics experience and have managed over 1 billion records. I have a stellar work record in both the private and public sectors. Thank you very much for your support and allowing me to participate on the Blogger’s Pit Stop!